I thought it would be pertinent to run over some basic theory in relation to static pressure and its benefits, as all fans are not created equal. Furthermore; I hope that by covering the basics it will help the newer members grasp what we are trying to achieve a little easier. So what is Static Pressure? Static Pressure is usually stated either in inches of water (inH2O) or in millimeters of water (mmH2O). 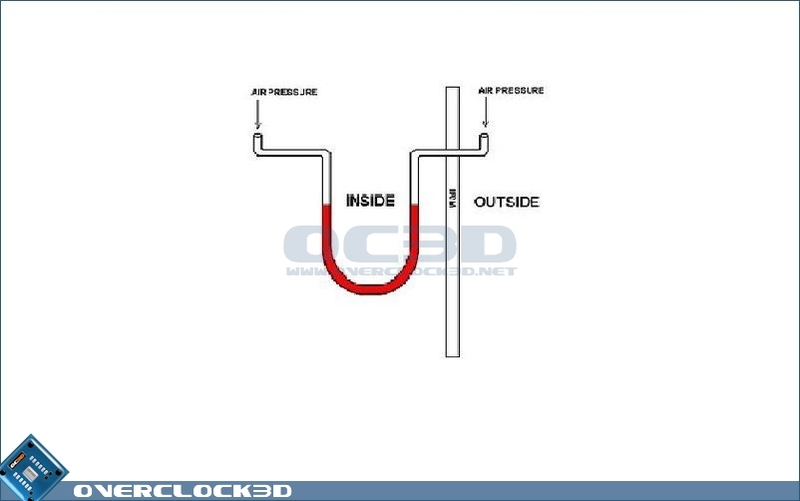 It is essentially a measure of the differential air pressure between the air pressures inside an application vs ambient air pressure outside of an application, which for airflow calculation purposes is usually 0 (zero). 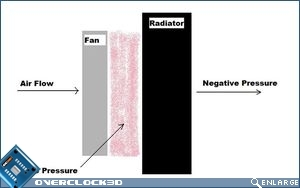 There is an inverse relationship between airflow and static pressure. As the pressure differential rises, airflow drops. The first image (above left) is that of equal pressure, where the pressure on the outside of a case is equal to that on the inside...and not an optimal solution for cooling. 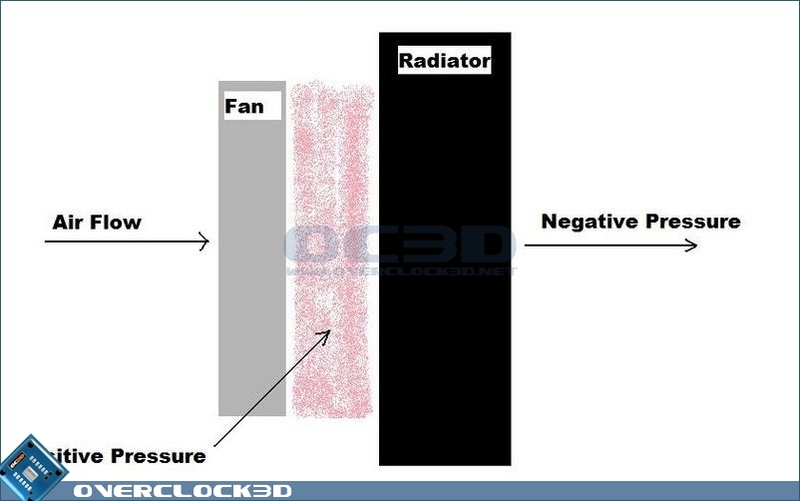 The second image illustrates negative pressure where the pressure inside the case is less than the outside pressure. 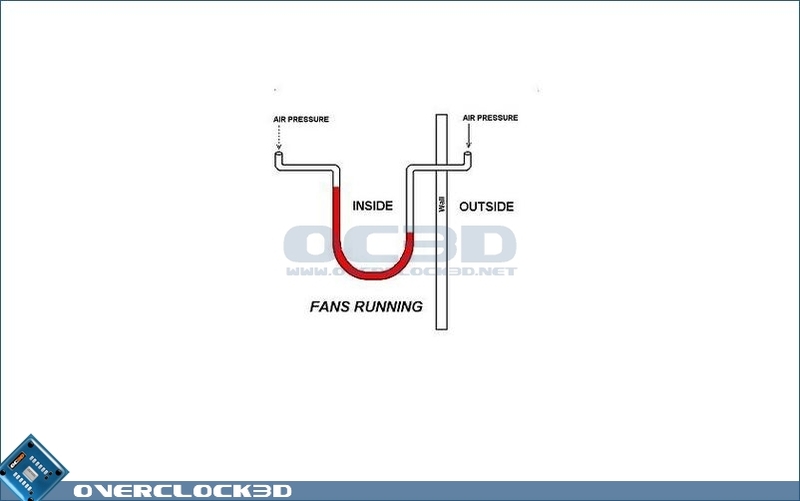 Negative pressure allows air to enter the case at the right direction and speed and is needed for efficient cooling. 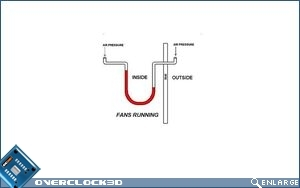 So by now you may be asking "What the hell does this have to do with fans?". Ok, as air flows through fin configurations (either on a heat sink or heat exchanger), the small openings constrict the flow, creating a pressure drop. Because air flow velocity is directly proportional to air flow volume and proportional to the static pressure drop, heat sinks and heat exchangers require a higher flow velocity pressure to move a given volume of air through a heat sink. To increase the velocity, an increase in fan power is usually necessary to maintain the same mass flow of air through the heat sink.